New research, led by the University of Glasgow and published today in Current Biology, found that fish who consumed a large meal had to move to the back of their swimming social group due to reduced aerobic capabilities cause by food digestion. Previous research has shown that hungry individuals are often found towards the back of animal groupings, such as a school of fish. However, this research shows that even dominant members of the group can't maintain their leading position after a large meal. 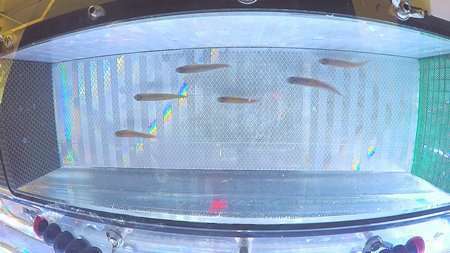 Scientists found that during the digestion process leading fish were forced to slow down and take up positions towards the back of the group in order to conserve energy. Humans experience a similar reaction if they try and exercise after a large meal. University of Glasgow researchers believe that the post meal slump associated with digestion could play a role in the group behaviour of wild animals. Particularly affecting which animal leads a group in the time after food consumption and during digestion. Dr. Shaun Killen, from University of Glasgow's Institute of Biodiversity, Animal Health and Comparative Medicine, said "Imagine if you were to go for a run with a group of friends. If you had just eaten a large lunch but they hadn't eaten in a few hours, you would find it more difficult to keep pace with them." "We see the same effect in groups of fish but in this case it may have serious effects on how animal social groups function in the natural environment." The study shows that the basic metabolic demand for food processing left individual fish with less cardiovascular ability to perform physical activity, particularly demanding tasks such as swimming at the front of a dynamic group. The post meal dip in aerobic effectiveness even applied to dominant or stronger members of a group, suggesting digestion is a key influence in which animal leads a group at any one time. Killen added, "Our study shows that, after feeding, individuals who might otherwise perform the role of leader will be forced to move towards the back of a moving group. "That change of position means that, temporarily at least, these individuals will be less able to have any influence group behaviour. This raises further questions over group dynamics during these periods, and possibly phenomena such as social learning, information sharing, and group decision making." The paper, "Metabolic costs of feeding predictively alter the special distribution of individuals in fish schools" in published in Current Biology. If the leading fish are getting the most food and then have to drop back to digest it, wouldn't that cause the entire school of fish to eventually be well fed as they cycle through the process?